you know what’s better than homemade pesto? NOTHING! i want to eat it by the spoonful it’s just so damn yummy! it’s also brilliantly simple- you’ll kick yourself for not making it before. there are a million and one things to do with it once you’ve got it, and tomorrow i’ll post my first suggestion. as with all simple recipes- use the highest quality and freshest ingredients you can get your mitts on. and lastly: anyone who thinks you need parmesan cheese to make an incredible pesto is dead wrong. save money, your arteries and cows- try it vegan! the how: throw it all in a food processor and blend. add salt to taste. show no restraint. Ooh, I need to start making my own pesto, thanks for the inspiration! I love pesto! 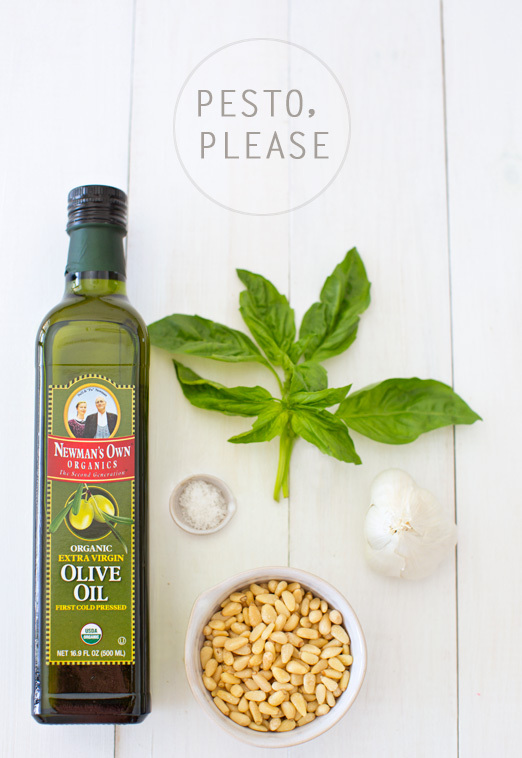 And making your own is actually so simple… I like the fact that I'm in control of what I put in my pesto. For example, high quality olive oil instead of sunflower oil, which is what they most often use in the ones you buy. I love that your recipe is vegan! I'm not very good with dairy, so I love you forever for this recipe! yay! i'm so happy ya'll are into this one. it's seriously SO good! This looks delicious, nothing quite says summer like pesto! i'm not entirely sure… i always just freeze whatever t i don't think we'll eat within a few days! Love homemade pesto! I too could eat it by the spoonfuls. I use all the ingredients you listed, and also throw in 2-3 kalamata olives. Btw, love your Blog! Just made this recipe. I was very close to ruining it by adding too much salt (I'm very new to cooking!) but I think I saved it with more basil and some lemon. 🙂 Thanks for the tasty vegan recipe!